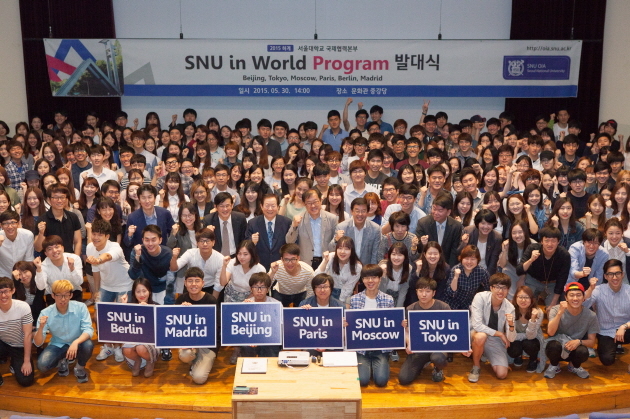 The SNU in World Program is a Study Abroad Program launched by Seoul National University Office of International Affairs. This program was initiated in 2011 to offer SNU students a chance to deepen their understanding of major countries around the world. At present, eight programs are held in summer (SNU in Beijing/Beijing for graduate students/Tokyo/Tokyo for graduate students/Moscow/Paris/Berlin/Madrid) and one program in winter (SNU in Washington), allowing a total of 345 participants per year. By providing students various lectures on each country's society, culture and language, SNU aims to cultivate global leaders with a wider perspective of the world. CHOI Jin-min, an executive officer at the SNU Office of International Affairs in charge of the SNU in World programs, explained that objective of the programs is to enable students to become experts of the specific regions, in addition to enhancing linguistic skills. As more students are seeking to participate in the programs, OIA is planning to create more versions of SNU in World in regions that are influential in the social, cultural and political context. SNU in Paris, a new SNU in World program starting this summer, aims to offer 30 students an opportunity to experience France's capital city and a crucial player in Europe's politics, economy and culture. The program is divided into two sections: two weeks at SNU (June 18 to July 1, 2015) and three weeks at Université Paris VII – Diderot (July 6 to July 24, 2015). By successfully completing this program, participants can earn three credits. During the two weeks at SNU prior to departure, the program consists of lectures on 'Understanding Contemporary Europe' and intensive French courses. Both components of the program will be continued in Paris. In addition, participants are expected to complete a group project, which they will present to the rest of the members towards the end of the program. In between these sessions, participants can visit the French Parliament and other major institutions, and also attend an event on July 14 to remember the French Revolution. SNU in Berlin is another new summer program that offers 30 students an opportunity to experience Germany's capital city, which was selected because of its social, cultural and political influence in world affairs. Similar to the other SNU in Europe programs, the program in Berlin consists of two weeks at SNU and four weeks at Freie Universität Berlin. Participants may earn three credits by completing this program. During the two weeks at SNU, participants will take lectures on 'Understanding Contemporary Europe' and intensive German courses. In Berlin, participants will take more intensive language courses and lectures from several distinguished experts such as Dr. W. Werner from Universität Mannheim. Just as the other SNU in World programs, participants must give a group presentation on a specific issue at the end of the program. Study visits to notable places including Sachsenhausen concentration camp and the Berlin Wall Memorial are also a part of the program. Newly offered beginning from this summer, students now have the opportunity to take intensive Spanish language courses and special seminars at Spain’s cultural and political center, Madrid. The program requires students to attend preparation courses for two weeks at SNU before studying at the University of Madrid (Universidad Complutense de Madrid). In addition to language courses, students will learn about Spain’s politics, society, economics, art, and culture through special lectures. Participants receive three credits for completing the program.